Without getting too bogged down into the weeds of biblical history, the prophet Nehemiah was a Jew who served as an affluent governor of his people under the King of Persia (what is now Iran), who was then ruling over the Jewish people, who had returned to Judah from being exile in Babylon. Judah was the so-called Southern Kingdom of Israel, after the north-south split, where Jerusalem existed. Nehemiah was a good governor and did not take the additional taxes and food rations that were his due, by Persian edict, from the Jewish people, as other Jewish governors had done. He also forced the other Jewish nobles to stop over-taxing their own people (who were doing so against Jewish law forbidding usury), who were over-mortgaged in the pre-Nehemian system, and often forced to have their children do undesirable things to offset debt obligations—Nehemiah was a good egg. He got a brainstorm to rebuild the wall around Jerusalem, not to make a name for himself, or for personal gain, but because it needed to be done for the protection of the capitol and it seemed like the right thing to do. A certain alliance of enemies of the Jewish people did not like the idea of a rebuilt wall around Jerusalem, as it would foil their schemes to eventually overtake it. And thus, set out to kill Nehemiah and scuttle his shovel-ready, well-orchestrated and nearly completed public-works project. Nehemiah 6:1 Sanballat, Tobiah, Geshem the Arab and the rest of our enemies heard that I had finished the wall. There were no gaps in it, but I had not yet put the doors in the gates. 2 Sanballat and Geshem sent me this message, ‘Let us meet together in one of the villages on the plain called Ono.’ But they were plotting to hurt me. 3 So I sent some men to say to them, ‘I am doing an important task. I cannot go down there. The work should not stop, so that I can go down to meet you.’ 4 Sanballat and the men who were with him sent me the same message 4 times. Each time I gave them the same answer. Puh-leez!, if you will pardon the slang. “Let us meet…” Nehemiah knew, in his spirit, they were up to no good and that he needed to stay focused on his work. But the city of Ono, from Jerusalem, was a one-day trip going and a one-day trip coming back, meaning Nehemiah’s work would have been sidetracked for nearly 3 days. 5 Then Sanballat sent his servant to me again. This was the 5th time that he came with the same message. The servant was carrying a letter in his hand. Sanballat had not closed the letter. “Ono” he didn’t! Sanballat is trying to start some mess! Where I come from, some people call it being “loud talked” when someone tries to “put your business in the street” like that. 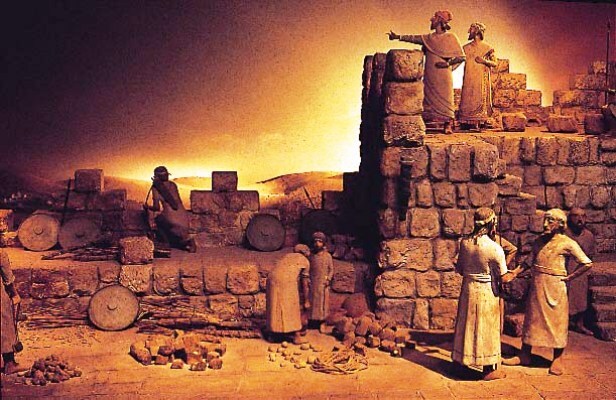 Nehemiah had the good sense to calmly and succinctly try to set the record straight and made it clear that he knew what Sanballat was up to, hoping he would stop the madness. Stop it! Here we go with another sketchy invitation, with the same words: “Let us meet…” It was absolutely forbidden for any layman to enter into that part of the inner temple where the doors could be shut. Nehemiah’s supposed confidant (whose house he was already in, whose people’s people he knew of) was a back-stabbing co-conspirator of Sanballat. 11 But I said, ‘A man like me should not run away! I cannot go into the *temple to save my life. I will not go!’ 12 I realized that God had not sent Shemaiah. Shemaiah had pretended to give me a message from God because Tobiah and Sanballat had paid him. 13 They paid him in order to frighten me. They wanted to make me do what was wrong. Then Tobiah and Sanballat could make people think bad things about me. They could make me ashamed. LOL! Until I met Nehemiah, I did not know you could get away with praying and naming names of people (including preachers, smile, because Nehemiah called out some would-be prophets in his prayer) who are getting on your nerves and trying make what is yours, theirs, by trying to jam you up, ruin your reputation and in the ensuing drama, try to separate you from access to the power of God in your life. 15 We finished the wall on the 25th day of the month called Elul. It took 52 days to rebuild the wall. 16 Our enemies heard that we had finished. All the nations round us became afraid, and they felt less important. They realized that God had done the work. Such understated elegance from Nehemiah: “They felt less important” (the old silver-tongued angel!). I love that, but that’s probably just my flesh, huh? Well, it was Nehemiah who said it, not me. Nehemiah used his gift of discernment, a cool head, survival of a moment of self doubt that led to a near-stumble, but a quick recovery, along the way (from talking to the wrong people! ), and ultimately his faith, prayers and strength of character led him to successfully navigate his way through the wiles of the enemy, and walk in the grace that had been afforded him. Note to self: Stay focused! Don’t let others force you into a manufactured crisis in your life—and always test the spirits (and the facts) to avoid taking bad advice. Thanks to Pastor Dave Huffman of South Potomac Church, White Plains, MD for the inspiration for this piece. This entry was posted in Bible, Politics, Religion and tagged Bible, Christian, God, Gospel, Jerusalem, Jesus Christ, Judah, nehemiah, Nehemiah's Walls, Old Testament, Persia, Rapture, Sandballar, Savior, Xerxes. Bookmark the permalink. 27 Responses to Dear God, These People Are Straight Trippin’! Excellent post! You write very well and bring a story to life that I wasn’t really aware of. I am humbled, as I so honor your “helps” mission! Very cool of you! Well the big news is Merideth’s baptism-smile! Thanks for checking in and for reading and taking the time to offer encouragement! My favorite line is, “Let us meet in [the village of] Ono.” The name of the village alone was a pretty big clue. Great post! Thank you. LOLLLLL!!!! I’ll have to check out your “Prince” Congrats on finding your calling and walking in the gifting to pull it off! I love your blog cover motif- I could watch TurnerClassicMovies (thought I guess he really shouldn’t get the credit) all day and night! I haven’t watched TCM for awhile, but the movies are great. TCM’s silent films are my favorites. Despite my fascination with John Gilbert, I enjoyed reviewing Christian movies the most. The silent versions of “The Ten Commandments,” “King of Kings,” and “Ben Hur” are much better than the later versions. in my opinion. They are clever. For example, the parting of the Red Sea was done with jello in the 1925 version of “The Ten Commandments.” Imagine! I was just talking to a friend about that Jello scene today! Amazing! I got that bit of information from Leatrice Gilbert Fountain, John Gilbert’s daughter. Her mother, Leatrice Joy, starred in the 1925 version of “The Ten Commandments.” The parting of the Red Sea was just as impressive as it was when DeMille did the remake in color. The 1925 version is more interesting because after the sons of Israel worship the golden calf and Moses breaks the tablets of stone, the film jumps to the 1920’s. A family is reading Exodus. The entire second half of the film is presented like a parable 1920’s style. The moral of the parable is spelled out in the subtitle: “When you break the Ten Commandments, they will break you.” One of the main characters breaks commandment after commandment. Then the film ends as the “bad guy” drives his boat into a huge rock sticking out of the water, emphasizing the theme. Interesting! It’s so ironic to me that I am about to post a Ten Commandments-related piece, about Moses, this morning.With some research on the Red Sea buried in it. I hope you get a chance to read and give me your impressions! I look forward to reading it! Will follow your posts. Thanks. I’m glad I checked out your posts… I’m glued! “he bore them on his feathers.” May you and I be steady as we go! Thanks for writing! Love, love, love the “realness” with which you wrote this piece…so impacting and encouraging! I have a 10 year old and 3 year old (and 2 grown ones and 4 grands) we will grow with you! Thanks so much for the encouragement! God Bless! A very fun current take on an OT account; thanks so much for your thoughts. “would also put him in line for a stone shampoo, with a complimentary rocky scalp-massage treatment” – I got a good laugh out of that line. I absolutely LOVED the entire post. Well written and packed for effective application. God bless you. God Bless YOU! Ms.McCauley, so glad you took the time to write. I love your Proverbs treatment of friendship! Take Care! Thank you for your thought provoking and entertaining writing. Making it real and relevant to people’s every day experiences. I visited because you were kind enough to follow my blog. Very glad I did. I wish you success with what is clearly a work of love. Thanks so much! Our home is adjacent to State Protected Wetlands (Maryland) and I find it interesting that certain species of birds, not unlike the Grebe, frequent our area. Keep in touch! Oh my goodness THIS is how I tell Bible stories! I love how you write – it really gets me right in my real life. Clicking follow right now. You are too kind. Love your cover art. God Bless! Nehemiah’s story rings true today. I view it as a lesson that Nehemiah’s wall is our Constitution. Sanballat’s goal was to prevent its completion by killing Nehemiah. Government is Sanballat. They want to rebuild the wall . Sanballat would have succeeded if Nehemiah let his guard down. The wall would have changed height perhaps, allowing ever prying eyes of Sanballat to spy. Today government is fighting to allow death to American citizens by drone. Destroying our liberty and justice. Dianne Feinstein wants to disarm Americans, like Sanballat wanted to destroy Nehemiah. Falsehoods written by Sanballat nearly started a revolution against Nehemiah. The comparisons are many. The difference is Nehemiah prayed to God for guidance, in return God showed him the way. Americans have been trained to beg”Sanballat” for help , in return Americans have been divided by class, race, religion. As always, thank you Jim for using your talents to lead America back to liberty and the individual. God bless. Wow, I am humbled. To God be the glory for his word!